This Alaska cruise takes you from Puget Sound in Washington through Stephens Passage to Juneau, Glacier Bay, Sitka and Ketchikan on your way back to Seattle. Bonus offers include free onboard spending, free deposits and upgrades - if you book soon. Holland America's first Signature Class ship, the MS Eurodam was launched in 2008 and underwent a major makeover in 2015. 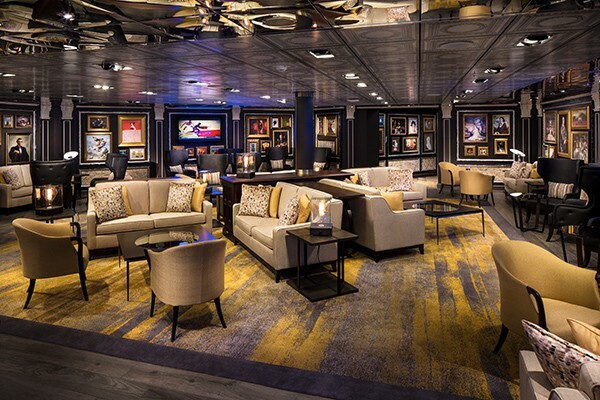 During the refurbishment, the Eurodam was fitted with a gorgeous new Gallery Bar next to the Casino, along with new dining options, new entertainment venues and upgrades to some of the suites. The Eurodam carries 2,104 guests with a crew of 929 and was the largest ship in the fleet when it was launched. In July of 2017 Oprah Winfrey launched the inaugural "Share the Adventure" cruise aboard Eurodam, an exclusive partnership with Oprah Magazine O, with activities including tai chi, meditation, an onboard O’s book club, and healthy cooking demonstrations. Guests interested in a Musical Experience will enjoy the full Music Walk™ with new venues, including Lincoln Center Stage, B.B. King's Blues Club and Billboard Onboard. Starting in 2017, the Eurodam has been cruising from the west coast of the U.S. From May to September, the ship operates Alaska Inside Passage cruises out of Seattle; from October to early April, she cruises out of San Diego, visiting Mexico, Hawaii and the South Pacific Islands of French Polynesia. The ship's 11 decks include six cabin categories. All cabins come furnished with plush Euro-Top mattresses and flat-screen TVs. In the 2015 refit, suites received updates to the furniture, carpeting and bathrooms, as well as a USB outlet on the bed's headboard and a Bose Bluetooth speaker. Inside cabins have two lower beds that convert to a comfortable queen-size bed, a bath with massaging shower head, and an affordable price. Spa interior staterooms are available with yoga mats and other spa amenities. These expansive staterooms include two lower beds convertible to one queen-size bed with the Signature Mariner's Dream™ plush Euro-Top mattress, premium massage shower heads, and an ocean view. With a verandah accessed via sliding doors, floor-to-ceiling windows and comfortable sitting area, these suites are filled with light. They include two lower beds convertible to one queen-size bed—the signature Mariner's Dream™ bed with plush Euro-Top mattress, plus a mini-bar. This cabin is equipped with a 54 sq. ft. verandah accessed by a single door, and is slightly larger than the ocean view cabins. There is a king-size bed convertible to twin beds, along with a sofa, verandah furniture with a cocktail table, dressing room and bathroom with shower. Spa Verandah Suites offer spa amenities such as yoga mats, an iPod® docking station, and an in-room counter-top water feature. The spacious Neptune Suite is furnished with two lower beds convertible to one king-size bed, bathroom with dual sink vanity, full-size whirlpool bath & shower with additional shower stall, large sitting area, dressing room, private verandah, a sofa bed for two guests, and floor-to-ceiling windows. The luxurious Pinnacle Suites come equipped with one king-size bed, an oversize whirlpool bath, a shower with separate stall, living room, dining room, dressing room, private verandah with whirlpool, 1 sofa bed for 2 persons, microwave, refrigerator, guest toilet, private stereo system, and floor-to-ceiling windows. In 2015, after the refurbishment of the Eurodam, it became the first ship in the HAL fleet with a MusicWalk. This popular area of the ship is just outside the main dining hall and serves as a central entertainment area. After dinner, stroll over to B.B. King's All Stars in the Queen's Lounge, or listen to classical music at Lincoln Center Stage. If you prefer to get involved, there are sing-alongs in the Billboard Onboard piano lounge with dueling pianos. Enrichment programs go on throughout the day, including computer workshops and classes, cooking classes, fitness seminars and wine tastings. Through a partnership with the recipe development experts at America's Test Kitchen, passengers can attend cooking seminars and learn how to make gourmet dishes. In the evening, the Mainstage lights up with two music and dance performances daily, along with comedy and magic shows. On select cruises, you'll see the BBC Earth Experience, created via a partnership between Holland America and the BBC. On Alaska cruises, the performance of "Alaska in Concert" combines live music with a backdrop of breathtaking footage from the BBC Earth television series, "Wild Alaska." 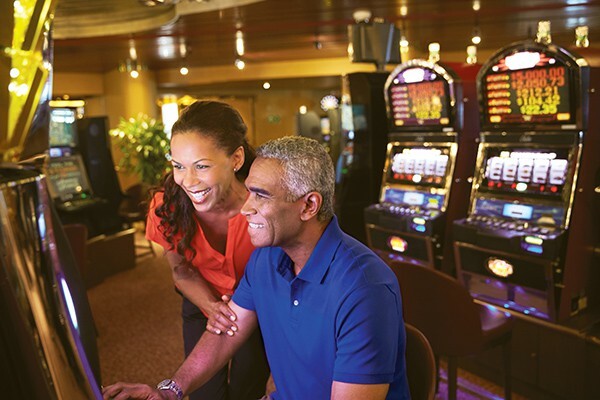 The non-smoking casino on Deck 2 midship offers slot machines, gaming tables, and regular tournaments such as Texas Hold'em and lotto drawings. For those who want some physical activity after a day of enjoying the cuisine, there are volleyball and basketball courts, ping pong tables and two pools. Holland America Line is known for its culinary excellence, and dining on the Eurodam is a highlight of every cruise. A Master Chef makes sure food is world-class in terms of flavor and presentation. The Master Chef also runs a culinary council for the ships of the Holland America Line to provide excellence in meal preparation and dining service. 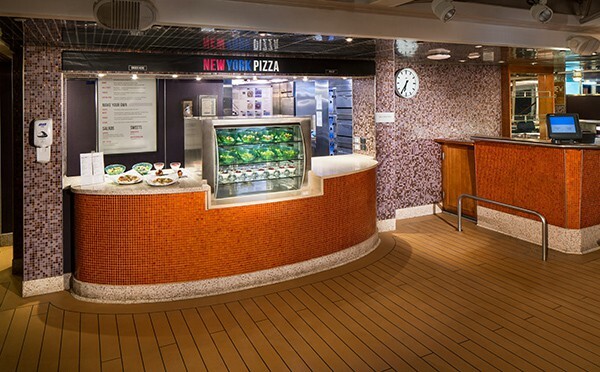 Vegan and gluten-free options are available throughout the ship. Main Dining Room - A two-story dining venue open for breakfast, lunch and dinner with a variety of menu options, including vegetarian and locally inspired cuisine. Dinners can be ordered in five courses with recommended wines. The main dining rooms also honor the “As You Wish Dining,” for dinner so you can eat at any time from 5:15 to 9 p.m. You can also choose either early seating at 5:45 p.m. or main seating at 8 p.m.
Lido Market - Buffet format open for breakfast, lunch and dinner. Lido is a marketplace-style buffet in a cafeteria setting, where passengers select items from various stations, along with several made-to-order options. At breakfast, guests will find an omelet station, fresh orange juice, eggs and pancakes. Lunch includes international cuisine, and for dinner, the buffet serves the same menu items as the main dining room. There is no extra charge in the Lido Restaurant. New York Pizza - Located near the Sea View pool, the pizzas are made-to-order with various toppings or guests can pick their own ingredients. The thin-crust pies come out piping hot in individual-sized portions and can be paired with salads and desserts. Open 11:30 a.m. to 11:30 p.m.
Tamarind - A large variety of Asian delicacies, from dim sum to sushi and curry, are served at Tamarind every night for a $15 per person fee. At lunch time, this dining option is free. Canaletto - Named after a famous Italian artist, this Italian-themed restaurant serves a variety of Italian and Mediterranean specialties, including vegetarian options. Three courses are served for $10 per person. 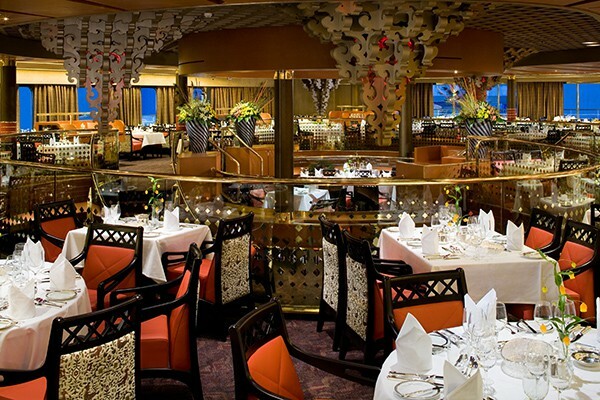 Le Cirque is only open for one night per sailing, in the same dining room as the Pinnacle Grill. This acclaimed restaurant received the James Beard Award for Restaurant of the Year, so you know it's a special experience. Cost is $39 per person.